Well, I'm sorry to say that my last interview for this month isn't finished yet. So, I'll be posting my final interview for the month a bit later and will cross-post it on my social media sites. Apologies for missing the mark, sometimes life just gets too busy. But I promise you, it'll be worth the wait! However, as I just got back from Schoolism.com's workshop weekend in Toronto, this seems like an appropriate time to talk about another valuable resource for researchers looking for that elusive bit of information on woman animators: the Canadian Animation website and blog. If you keep an eye out for them, you're sure to run across people like Grayden who are working hard to bring recognition to animators, both women and men, and both well-known as well as those not-so-well-known. But rather than just relying on interviewers and bloggers, those interested in this facet of the animation world should not be afraid to get out there and find their own opportunities to meet these women of animation. Case in point: this past weekend, I made a nine-hour round-trip drive to Toronto. Schoolism.com held a two-day, live workshop with artists and animators discussing their careers and lavishing advice on people who want to improve their skills. 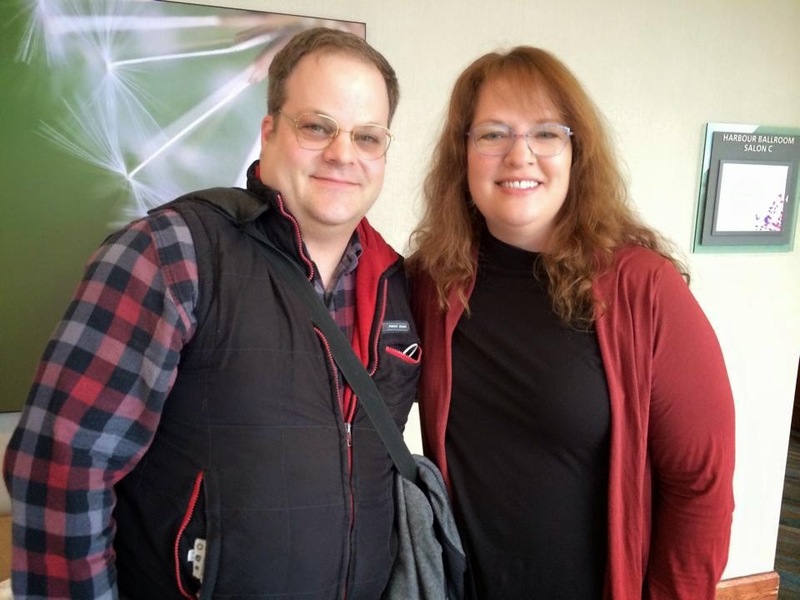 I went there to hear Brave director Brenda Chapman's presentation with her husband Kevin Lima. After meeting Ms. Chapman on Saturday night, the next day we were all treated to a three-hour presentation where power-couple Kevin and Brenda talked about their personal history, the ups-and-downs of the animation industry, how the industry has changed across the span of their careers, and much, much more! As a special treat, they even showed their CalArts student films. Was it worth the time and money to make the drive? You bet it was! Even if I wasn't working on a project detailing the history of women in animation, the information that Brenda and Kevin provided was the kind of first hand data that students who want to work in the Hollywood animation industry need to hear. Yes. Sometimes those opportunities may appear a little too far to visit. Yes. Sometimes it's going to cost you a pretty penny to attend events like this. But if you look carefully, you can find opportunities closer to home. Case in point: Alma, Michigan is a 45-minute drive from my house. Back in February, I attended a small student-run anime convention at Alma College and got to meet animator, studio owner, producer, voice actress, and stunt-woman Samantha Inoue-Harte (talk about a modern-day "Renaissance woman"!). Samantha teaching me what a 'glomp' is. Filled with boundless energy and an enthusiasm that I have only seen matched by Martine Chartrand, Samantha turned AlmaCon into a four-hour tornado of funny stories, a realistic vision of what it's like to work in the animation (and film) industry, and tips on improving our skills as she showed us first hand how she animated characters for Disney's Lilo and Stitch television show. It's not often that you get the chance to watch an animator at work but Samantha turned it into a spectator sport where you're laughing while you're learning. I started animating over twenty years ago and her two-hour animation workshop hammered home the fact that there's always something more that I can learn about our craft. Need another example? No problem. In a little over a week, Natasha Allegri, the creator of "Bee and Puppycat" will be speaking in Detroit at the Midwest Media Expo. Will I be braving the throngs of cosplayers to hear her speak? After hearing her presentation at last year's TAAFI festival, you bet I will! And I hope to see many of you up-and-coming animators there too. So keep an eye out for opportunities (both local and distant) to connect with your favorite animators, as well as those that you haven't heard of before. I guarantee that you'll be glad that you took the time to listen to their wisdom and experience. Whether it's our history or our craft, I'm always learning something new from animators who are kind enough to share their experiences in this roller-coaster ride we call 'animated film'. Women in Animation: Blue Sky "Crew Stories"